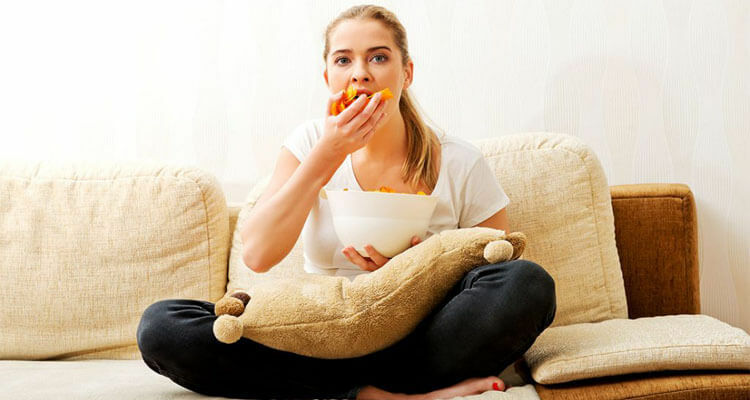 What are some things you can do to keep yourself from mindlessly eating? During mealtime, add 20% more veggies to your plate. When you add more veggies, your plate looks fuller and the additional volume will also make you feel fuller. Turn off all electronics. When our mind is focused on our latest TV show, rather than on the food we are eating, it is harder to tell when we are full. If you focus only on the food you are eating, you experience the tastes and smells more thoroughly and as a result you enjoy your food more. Studies show that mindfulness – being aware of changes in our body as they happen – lead us to eat less. If you feel like a snack, don’t straight out of the bag. Opening a huge back of pretzels and munching as you study or watch a movie will give you a completely warped idea of how much you are actually eating. You can’t see through the bag of pretzels, and it certainly doesn’t tell you how many servings you’ve wolfed down. Instead, read the nutritional chard on the back for how many servings are in each bag, and estimate a serving size poured out onto a plate or into a bowl. When you’ve reached the bottom of the bowl, you know you’ve eaten your share. You can break bad eating habits by making small changes in how you eat. Changes in how you eat will help you to control what and how much you eat, and will result in greater meal satisfaction and will help keep you from eating mindlessly. Sasha de Beausset is a Nutritional Anthropologist with a B.A. from Tufts University, an M.Sc. in Food and Nutrition from the University of San Carlos, and is currently in the process of becoming a licensed nutritionist. She has been awarded for her academic writing and research, and she has been blogging on food, health, and nutrition for over four years. Sasha is passionate about contributing to making quality and research-based information available freely on the web so people can inform themselves and make better decisions for their health.